Kentwell Hall and Gardens01787 310207work Historic HouseKentwell Hall is Suffolk’s hidden gem and one of England’s finest Tudor houses that stands within the most extensive moat in the county. The house is reached by a 3/4 mile long avenue of ancient Lime Trees. Kentwell is not just a house but a family home that has been saved and renovated over the years and offers an interesting mix of periods within what is still an essentially Tudor layout. The house is a classic example of an Elizabethan e-Plan manor house and was probably started in the reign of Henry VIII. Internally there has been some change but Kentwell still retains its grandeur including the Great Hall with its Minstrel’s Gallery. Throughout Kentwell there is a visual array of many stunning and important works of art including 14th century pictures, tapestries and a magnificent stain glass window. Kentwell’s gardens and grounds that extend to over 30 acres are often described as ‘magical’ and you will see why when visiting the Walled & Sunken gardens with their unique and special interest features, and as quoted ‘there is a surprise around every corner’. The Cedar lawn is the perfect setting to sit and wonder at some of England’s tallest Cedar Trees and the Sculpted Cedar that is designed on the theme of the Tower of Babel. It is considered to be UK’s biggest single wood carving. What makes Kentwell truly unique is that many Tudor buildings still exist including the Moat House; that is used during Kentwell’s many special events that run throughout the year. These include Tudor re-creations, WWI & WWII, Magic & School of Sorcery weekends and Dickensian Christmas. 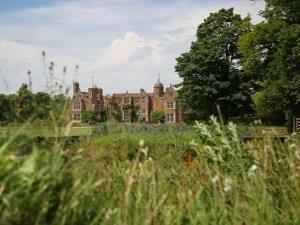 A day is never long enough to spend at Kentwell. Kentwell Hall is Suffolk’s hidden gem and one of England’s finest Tudor houses that stands within the most extensive moat in the county. The house is reached by a 3/4 mile long avenue of ancient Lime Trees.